What are these animals telling us? Because they are sensitive to change, so-called ‘sentinel species’ can reveal a lot about the ripple effects of pollutants in our environment. And that, scientists say, serves as a warning about our own fragile future. Working in Acadia National Park one recent morning, Sarah Nelson, a biological geochemist at the University of Maine, stood with her five assistants in boots and waders and jabbed at the sediment on the bottom of Hodgdon and Seal Cove ponds with long-handled nets. Their target was dragonfly larvae, and the samples they took to a lab on campus would be identified, analyzed and finally incinerated. In the ash they would measure concentrations of mercury, a toxic heavy metal that can wreak havoc on the environment and human health. For researchers like Nelson, the dragonfly is not just an elegant insect with a voracious appetite for mosquito larvae. It’s also a “sentinel” species, a stand-in for humans that provides clues to potentially harmful environmental conditions we otherwise might not notice. Fifty years have passed since Rachel Carson first coined the term, but as human impacts on the planet multiply, scientists say it’s still a critical concept for understanding changes in the environment. The study of sentinel species goes back a long time, arguably to ancient times when the art of augury was practiced. By examining the entrails of certain animals, it was thought, the fate of emperors or the outcomes of battles could be predicted. The classic sentinel species – at least in America – harks back to the mines of the 19th century. The expression “canary in the coal mine” – once employed to describe the process of releasing a small yellow bird into mine shafts to gauge air quality and the safety of miners – has become a linguistic fixture to illustrate how the fate of one species may portend the circumstances faced by others. A miner who watched a canary flutter off and fall or head into a tunnel without returning knew not to enter the darkness himself. If the level of toxic gases – usually, carbon monoxide – could kill a bird, the theory held, they could hurt a man, too, or even kill. “When the canary can no longer breathe, (it’s) a harbinger of human death,” said Patrick Keenan, outreach director at the Gorham institute. Over time, as scientific investigation has evolved, the canary has been joined by many other species that are monitored for an increasing number and range of reasons, including to predict humans’ safety. Scientists from state agencies, academic institutions and research laboratories in Maine are studying tiny copepods, certain fish species and larger crustaceans in the ocean, freshwater fish and migratory birds in ponds, loons on inland lakes, moose and bears in the North Woods. Researchers say many of these studies start on a shoestring and run long-term, their modest funding bolstered by a robust commitment of time and energy from students and volunteer citizen scientists. • Mercury has spread almost everywhere, sparking international debate and multinational treaties dealing with the pollution. • Lead – once the poster poison of children in older buildings in inner cities – is still the leading cause of death in adult loons, claiming more than one-third of North American loon populations. • Plastic waste, which is virtually indestructible, has become a commonplace pollutant in oceans all over the planet. • Creatures that span the ecological chasms between very different ecosystems are in peril from human-induced climate change and its ripple effect on the water column and food web of the seas. Nelson, the UMaine professor studying dragonflies, doesn’t need a lot of high-tech equipment to do sentinel species work. The critical tools are waders, nets, plastic sample bags, hand lenses and field guides. Yet the findings and implications of her work are anything but simple. Mercury is a potent neurotoxin that poses a special threat to health, especially for children, nursing mothers and pregnant women. Dragonflies represent an intermediate step between other classes of animals, filling a gap in existing data and bridging other research on mercury contamination in birds, fish and water. Her dragonfly studies take the monitoring of mercury to new levels, looking at forests and wetlands, both here and in areas across the country. Involving researchers, educators and citizen scientists, her work has been extended beyond Acadia National Park on Mount Desert Island to 25 national parks across the country. She hopes her work will yield valuable information about mercury in the food chain and in watersheds. Now, the focus needs to be adjusted slightly, to see clearly how the food web has been – and is being – affected by the toxin. Monitoring of sentinel species like the dragonfly is more complex now, because environmental, industrial and pollution factors have proliferated at an astonishing rate over the last half century, said Keenan, at the Gorham biological institute. And more intricate, complicated interactions are being uncovered all the time. “We’ve advanced in terms of our research and ecology,” he said. That progress and sophistication are likely to yield more sentinel studies, not fewer. As the number and complexity of sentinel studies grows, scientists are making efforts to integrate the resulting data into meaningful patterns. One major undertaking is focused on bringing together many research efforts by creating a network to collect data and assess environmental change on a continental scale. First approved for National Science Foundation funding in 2006, the National Ecological Observatory Network was granted $434 million to establish a network of 20 permanent monitoring stations to collect climate, environmental and biological data on a continuing basis. The network also includes 40 temporary land sites and 46 aquatic locations, said Lily Whiteman, senior public affairs officer for NSF. A new observatory is being built as part of the network, and it will sample sentinel terrestrial and aquatic species at 106 locations across the United States, including Alaska, Hawaii and Puerto Rico. The network’s projects will sample sentinel organisms such as microorganisms, mosquitoes, ground beetles, deer mice, fish, birds, plants, and aquatic invertebrates in an attempt to understand and forecast the impacts of climate change, land-use transitions and even invasive species, Whiteman said. Scientists will be watching how these animals fare in and affect various ecosystems across wide geographic territories, enabling them to make comparisons from one part of the continent to another. “It’s a very 21st century approach to ecology,” said Andrew Pershing, research scientist at the Gulf of Maine Research Institute in Portland and a professor in the School of Marine Science at the University of Maine in Orono. Without it, researchers are left to wring out every last bit of information they can find in a relatively limited ecosystem. Being able to collate and interpret information that spans a continent and its oceans would represent a big step in a more comprehensive understanding of complex issues such as climate change, ocean acidification and various kinds of pollution. But at a certain scale, the attempt to observe, collect and monitor information becomes “too big to grasp,” said Erika Latty, associate professor of botany at Unity College. Limiting the scope of the research to a sentinel species can actually enlarge understanding. Consequently, researchers are paying attention to what befalls many creatures at the bottom – as well as nearer the top – of the food chain for signs of widespread change or ripple effects that might ultimately pose potential risks – or means of rescue – for humans. One such bottom-of-the-food-chain creature is the marine copepod, Calanus finmarchicus, a tiny crustacean. It’s considered a sentinel species in the Gulf of Maine, because so many other fish and sea animals feed on it. It is a conduit from single-celled algae to larger fish and marine mammals, said Pershing, at the Gulf of Maine Research Institute. It is an essential bridge in the Gulf of Maine’s productivity, providing more than three-quarters of the diet of forage fish and sustaining much of the food web in the open waters off Maine. It thus plays a critical role in the health of herring, sand lance, mackerel and the North Atlantic right whale. Jeff Runge, biological oceanographer of the University of Maine and Gulf of Maine Research Institute, has investigated the copepod’s abundance and distribution patterns to learn more about what makes the species so successful here. 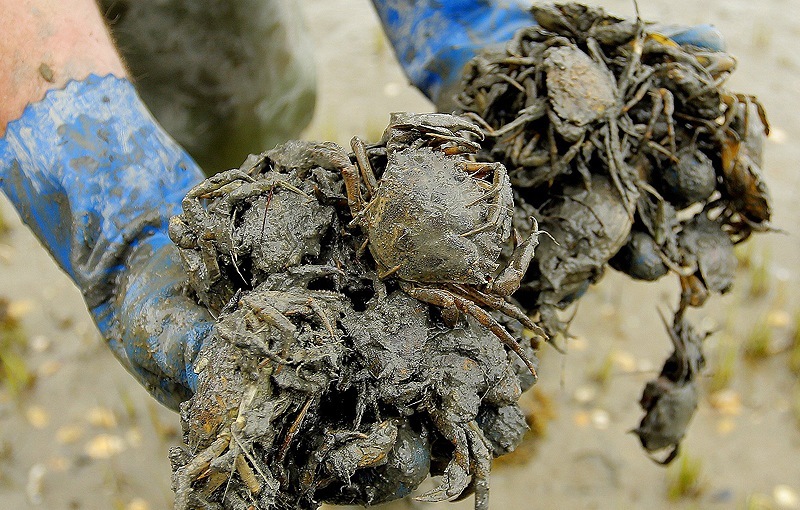 Marine researchers, along with fishermen, have observed that numbers of the crustacean vary significantly in inshore versus offshore waters, and from year to year, but scientists do not yet fully understand why. But the vast amount of data that have been collected, going back to the 1960s, Pershing said, may disclose patterns or causes that researchers otherwise might not be able to discern. “We’re still figuring out how to use that information,” said Pershing. But early indications link water temperatures, salinity and productivity in these populations. Paralleling this research in the Gulf of Maine, French scientists, using satellite data and climate-ocean models, predict that the warming of surface waters will shift the copepod north of the Gulf of Maine by 2050. No one yet knows whether the species will disappear from the area, as these models predict, or whether they will persist, sustained by cold water currents from the north. But one thing is certain: Any changes in this creature’s numbers, distribution or health in the ecosystem could impact the entire food web that depends on it. Phytoplankton blooms, for example, have raised concern about what effect climate change is having on the traditionally colder waters of the North Atlantic and Arctic. As the number and kinds of studied species increases and broaden, “these little individual species begin to reverberate,” said Rinker, the Gorham institute director. Layer upon layer of data produces a more comprehensive picture of how the environment is faring under human pressure, and how humans may be affected tomorrow by what we’re doing today, he said. The warnings coming from the animals seem clear enough, said Rinker. “All over the world we’ve been warning people: Something dark is coming our way.” Sensing that, he said, makes continued research on individual species ever more critical.